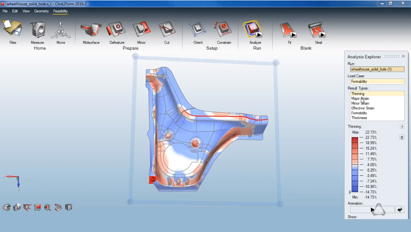 Altair Inspire Form, formerly known as Click2Form, is a complete stamping simulation environment. It allows users to better design products while reducing lead time by enabling early considerations of formability, process parameters, material utilization and cost. Thanks to the fast and easy feasibility module, companies can analyze parts in mere seconds to predict formability early in the product development cycle. The software predicts accurate blank shapes that can be optimally nested in progressive and transfer die layouts within manufacturing constraints. Altair Inspire Form can quickly check the form and feasibility of your models, and it starts with a simple click on the open file icon or even dragging and dropping your file into the application work area. The software offers a lot of flexibility of design formats, allowing the designer to work with for Catia, UG, Pro-E, ACIS, SOLIDWORKS or a mutual format such as IGS and Step. 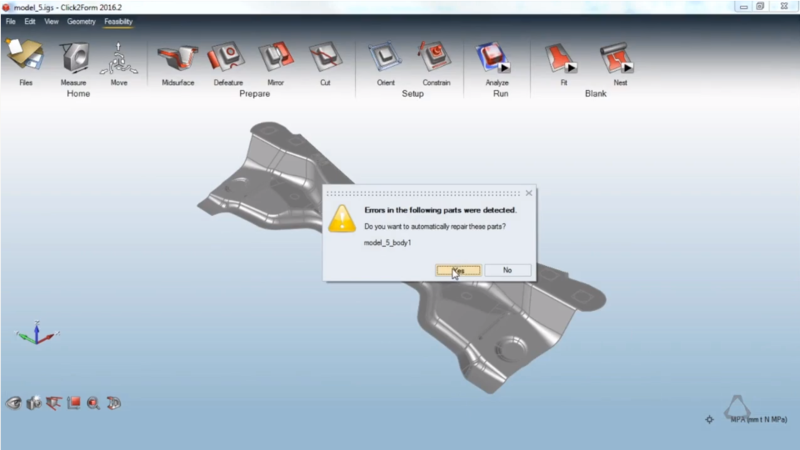 After you have successfully imported your design, Altair Inspire Form uses a smart algorithm to check for any geometry errors and prompt you to autocorrect them. After your file is loaded into the software and any geometry errors are fixed you'll need to design the surface geometry. The midsurface tool in the ribbon can quickly reduce solid models to a surface model. The thickness is assigned as an attribute to the surface geometry. 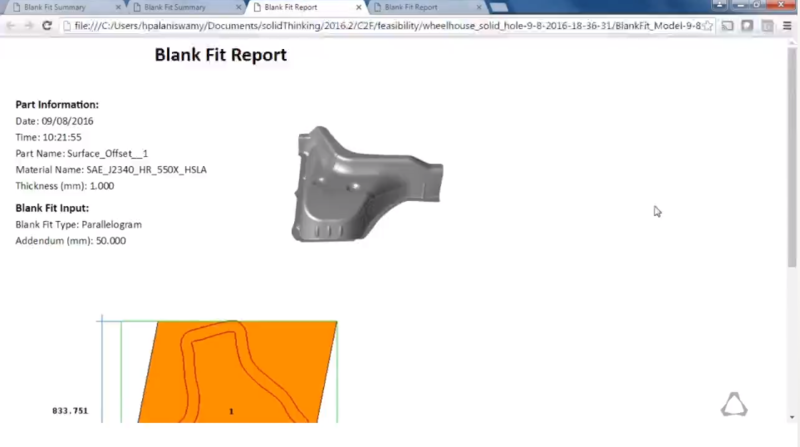 Before running any analysis you should fill all holes and notches in the model because in the diagnosis process holes and notches are found after forming is complete. 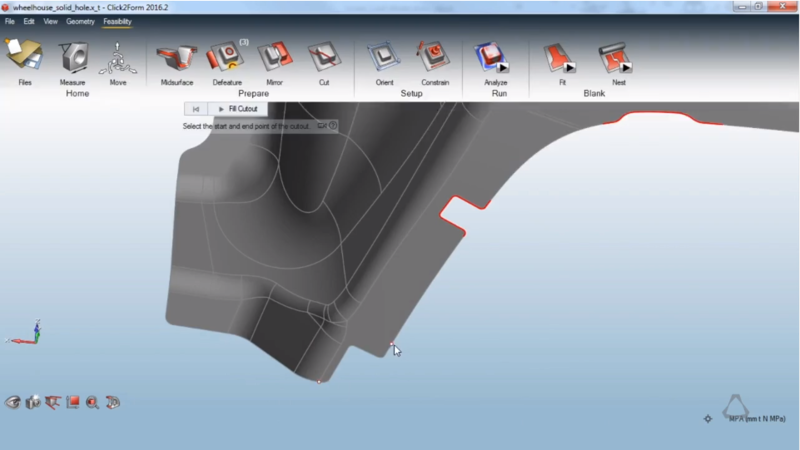 All of the holes are automatically recognized in the field with the field hold option in the feature tool. However, notches and cutouts will have to be manually recognized by you. After that, you're ready for the model setup! 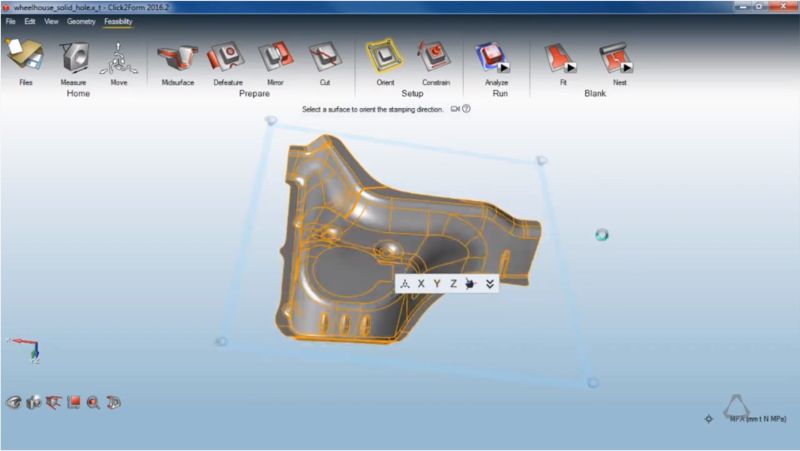 To assess form and feasibility, Altair Inspire Form needs a stamping duration to be specified. The orient tool in the ribbon helps you automatically estimate the stamping direction based upon the design geometry and will highlight the negative draft regions in red. You are able to modify this by using the micro dialog. 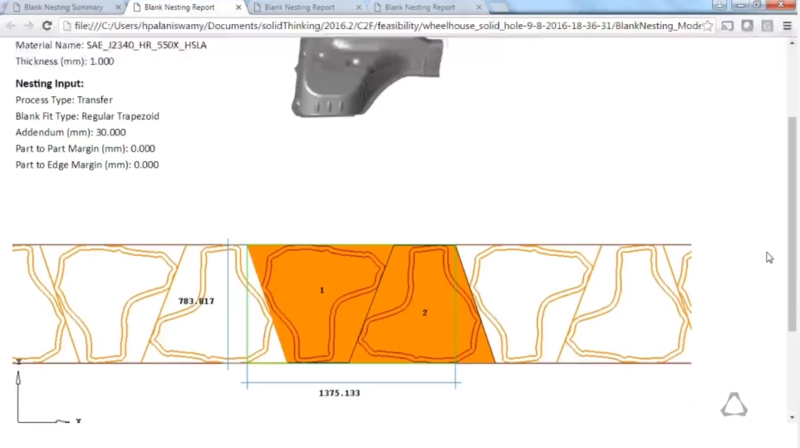 The software also allows you to model process conditions such as blankholder and drawbeads to emulate the stamping process, assessing its feasibility. You can define the blankholder by using a user-selected surface to the blankholder tool and define drawbeads on surface edges using the drawbead tool, both housed in the constraint feature. The force and restaining force can be set at low, medium, high or a user-defined value. Then it's time to run the forming analysis. Now that the model setup is complete, you can assign the material component from the material library. After that, it's just a click run icon in the ribbon and your feasibility analysis starts. You can visually watch the progress of the analysis in the run status dialog box. Once the progress marker gets updated with a green check mark and a green flag appears on the run icon your analysis is completed. To launch the results click on the green flag. Percentage thinning, plastic strain and formability based on materials diagram can be plotted to check the forming feasibility of the part. You can even animate reversing the path back to a flat blank. Altair Inspire Form also comes with a blank fit tool to fit flatten blank to standard shapes commonly used in transfer dye cutting. It begins with a click on the blank fit icon in the ribbon. Additional material, taking into account the addendum in the form tooling, can be added uniformly to the predicted blank shape. A blank can be fitted into several shapes of interest of your study. Click on the run status dialog to watch the progress of your analysis. You'll know your run has been successfully completed by the green check mark and a green flag on the run icon. To view your results, click on the green flag and they will load onto an HTML browser. A visual summary page will contain material utilization for each selected shape. Each report that you click on will open a detailed HTML report with the image of the optimal fit. That's not all you can do with blanks though, a blank nesting tool is also included in Altair Inspire Form. This allows for you to check for efficient materialization by flattening the blank in a coil for transfer dye forming and progressive dye forming. This closely mirrors the flatten and fit test and also starts the same way as the other test by clicking on the blank nest icon in the ribbon. First, you need to decide between the two standard process transfer or progressive dye. This decision will vary other options. The carrier option is available only for progressive dye forming, which will enable you to choose among standard carrier types. The fit shape option is only available for transfer dye forming, and this enables you to choose from standard fit shapes. Based upon the carrier or fit shape, a selection of nesting patterns are available. In the run status dialog you can visualize the progress of the analysis, and once it's complete the green check mark and flag will appear. The results are loaded into an HTML browser with a summary page with material utilization for each selected type. Want to see all of this in action? Check out our video playlist to get a walk-through of all the steps above.